I am thrilled to share our new video on the MET(T)A Protocol with you. Our Executive Director, Dr. Holly Daniels and I present to you the MET(T)A Protocol, a comprehensive treatment protocol utilizing the frameworks of EMDR Therapy and Buddhist psychology. I welcome you to explore this video and engage with us as we provide you with the MET(T)A experience. I agree with the best minds in mental health that treating Trauma is an imperative piece of treating substance use disorders and related mental health disorders. Click (HERE) to read our most recent peer reviewed article that outlines the MET(T)A Protocol’s trauma-focused approach to treat addiction and related trauma by combining Buddhist Mindfulness techniques and the 8-phase EMDR protocol for a robust, primary treatment rubric that covers the full continuum of care. I am thrilled to see the MET(T)A Protocol published and shared with the world. We need to improve the way we treat those who are suffering by providing trauma-focused treatment environments, tangible treatment protocols, and mindful lifestyle supports to innovate and strengthen therapeutic interventions. It is my conviction that we don’t become addicted because we’re stupid or “less than”; we become addicted because we want to survive. My talk on the Psychology of Addiction presented by Mindworks explores this concept and more. Please check out my blog post HERE. I was honored to be asked by the creators of Mindworks to add some helpful content to their App. Mindworks is a non-profit created by some amazing meditators – check them out here. And please join me on the App for my talks The Psychology of Addiction and Insight is the Answer to Addiction. I had the distinct pleasure this past week to lead intensive MET(T)A Protocol trainings with the staff at Roots Through Recovery, an outpatient program in Long Beach, CA that has traditionally utilized mind, body, and spirit-centered approaches to support recovery both from substance abuse and primary mental health issues. It was fantastic to sit with clinicians, counselors and administrative staff alike and talk about the importance of trauma-focused programming, clinic culture, and utilizing EMDR and Mindfulness for healing and long term recovery. I know a lot of folks who wish they could meditate more and build more mindfulness practice into their everyday lives, but it's not always easy to do. Creating an established spiritual space in your home can really support a regular spiritual practice. Forbes recently interviewed me and a few other spiritual and business leaders about how to create sacred spaces in your home. Lot of great tips in here - take a look! Even in California, the land of sunshine, it's difficult for many of us to deal with the increase of darkness during the winter months. 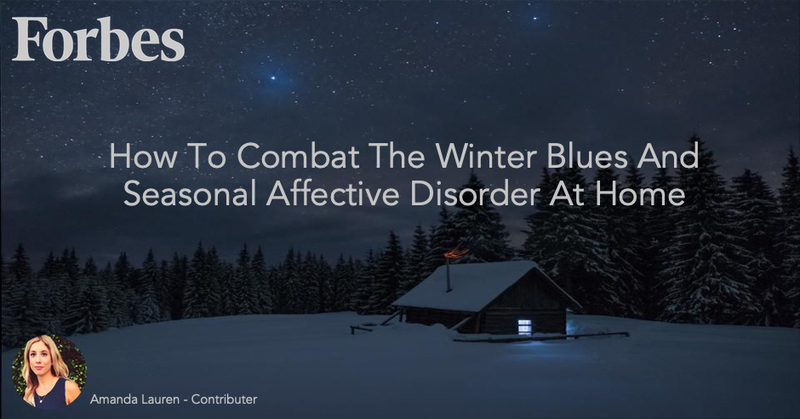 My friend at Forbes, Amanda Lauren, spoke with me recently about Seasonal Affective Disorder and the ‘winter blues.’ Check out her article HERE. I have been on Paul Gilmartin's Mental Illness Happy Hour podcast, and he provides an amazing service to all those who deal with these issues... and here on I, Survivor he shares his own story with Jenna and Wagatwe. At the end, I follow up on Paul's story with some more information and guidance about getting help with this type of trauma. I am so grateful for all these podcasters, and for the opportunity to help out as I am able. Click through or download for a listen. New Book Mindfulness for Anger Management Available Now! I have been teaching mindful anger management for over 20 years now, and I wasn’t sure if I would ever write the book version of it… But now I have. This is a workbook that can be used individually or as part of group work to discover and enact an anger management program for oneself that is anchored in Mindfulness. I’m excited about the release of the book November 6, 2018 and I am also excited to be thinking and talking about this subject in this way at this time. I am looking forward to seeing where this book leads me, and I am very much looking forward to hearing how people might be helped and have their suffering eased in these pages. My talk may have not been so much about pizza and the eternal as it was about feeding ourselves through applying the 8 fold path in our lives and the impermanent nature of things, but pizza and the eternal were certainly part of how I made my point. The dharma was taught to me over the years as containing all things, and all things can be our teachers. Always glad to have the opportunity to sit with the Against The Stream sangha and to share some of that dharma. Click through to download or listen. Anna David's new book The Miracle Morning for Addiction Recovery came out yesterday. I am honored to have my personal morning routine included amongst the dozen examples in the pages of this very helpful book --- mornings are my favorite time and I think they are a crucial factor in creating sustainable recovery. Well worth a read! Congratulations Anna David and her three coauthors Hal Elrod, Joe Polish & Honorée Corder! My latest interview with Safe For Work on the Wondery podcast network features a conversation on addiction in the workplace. Matt Ritter, Liz Dolan and I talk about information intervention, substance abuse prevention, wellness programs, and how to handle a coworker with a problem. I have become part of the team at Wondery podcast network, appearing as a guest on Safe For Work with hosts Liz Dolan and Matt Ritter. I have been recording more episodes and am looking forward to continued collaboration with the show and the network. I have become part of the team at Wondery podcast network, appearing as a guest on Safe For Work with hosts Liz Dolan and Matt Ritter. We discuss the impact of personal grief, loss and trauma on the workplace and on the individual within the workplace. I have been recording more episodes and am looking forward to continued collaboration with the show and the network. The latest issue of the EMDRIA Journal, a peer reviewed publication for EMDR Research and Practice, includes a very positive review of our book EMDR Therapy and Mindfulness for Trauma-Focused Care. Jamie and I are thrilled that the reviewer seemed to resonate with all the aspects of the book that we were hoping would be meaningful for the reader. The informal feedback we are getting along with reviews like this one has only strengthened me and Jamie in our resolve to have clinicians turn toward the implicit and explicit mindfulness elements of EMDR therapy in order to make the shift from trauma-informed to Trauma-Focused care. Click here to download a pdf of the book review. Last August I conducted a half day retreat at Seattle's own Rebel Saints Meditation Society. The talks were recorded and three of them are available on their website, iTunes and GooglePlay. It was the first retreat where I began talking about that which I now seem to land on consistently, the availability of practice in every moment, in every situation, in every thought, every feeling state. Reading the biography of Dipa Ma profoundly touched me, and linked in with my years of Zen training to remind me in the deepest of ways that this practice is not just about sitting on a cushion. This is a way of life. And so, in the face of adversity, in the face of dukkha, in the face of nibbana, we practice.